Today I was sent some yummy fudge to review from the company Fudgeridoo. 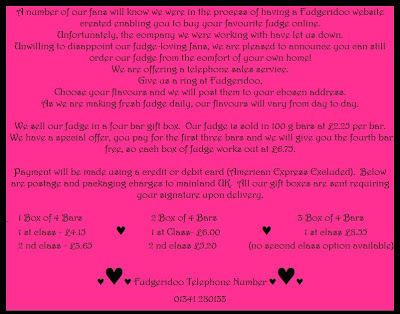 I was so excited, I absolutely love my fudge and looking through all the pictures on their Facebook page their fudge looked amazing. 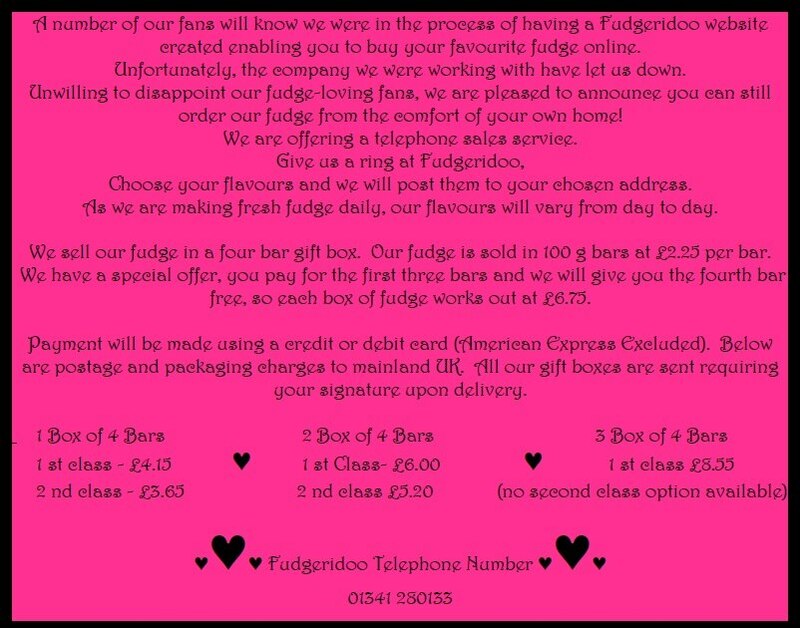 Fudgeridoo are a company who make a sell all sorts of different homemade fudges. I have to say their name has got to be one of the best names I've ever heard of for a company, i love it and it fits them so well. I was sent 2 different types of fudge to review which came in a lovely box. I couldn’t wait to get stuck in. The first one I tried was the rolo fudge. I love rolos and as i mentioned earlier i love my fudge so this was like heaven for me, I couldn’t wait to try this. I couldn’t believe have amazing it tasted, fudge and rolos have got to be the best mix ever. I loved the presentation of it too; it even had a rolo on the top. It looked too good to eat but I soon got stuck in. I've bought fudges in the past that have ended up been really dry and tasteless but this was perfect. I would defiantly buy this kind again. To be honest the only fudge I've ever really tried in the past is just plain normal fudge, i never thought about all the different kinds you could get till i came across Fudgeridoo. I'm so glad i did though and i will definitely be getting more in the future. The next one was raspberry lemonade. My first impression was wow. I love the way this one looks, the different colours mixed together looks so unique. I wasn’t too sure at first if I’d like this kind as it’s so unusual and different and not a flavour I would have thought of to go with fudge, but from the first bite I was in heaven, the flavours were so amazing together. This isn’t a combination I would have ever thought of for fudge, yet it works so well. When I first saw it my first reaction was please taste as good as you look, and I wasn’t disappointed. You can tell a lot of hard work went into both these fudges. In the box was also a card to say ‘Thank you for your custom’ which I thought was another lovely touch and makes you feel really valued as a customer. OMG Raspberry Lemonade Fudge! That looks amazing! I will def check out their FB.